[Santa Paula, March 12, 2018] — Ninety years minus a few hours later, on a Monday night as it was then, the Santa Paula Historical Society honored the estimated 411 men, women and children who died by drowning and floating debris when the St. Francis Dam in the mountains above Saugus ruptured, unleashing a torrent of water that didn’t stop until it poured into the Pacific Ocean five and a half hours later. Squarely in the floodpath sat Santa Paula, a farming community of some 6,500 sleepy souls when the water reached them at 3:10 a.m., three hours after the dam collapsed. Some — not all, but some — made it to higher ground thanks to biker lawmen Thornton Edwards and Stanley Baker who went door-to-door with a warning of impending doom. They’d gotten word from Louise Gipe and the other “hello girls” of the Santa Paula telephone switchboard that the St. Francis Dam had gone out and a flood was coming. Edwards, Gipe and many other Santa Paulans had never heard of the St. Francis. Monday night’s event proved the people of Santa Paula haven’t forgotten. Santa Paula has commemorated the dam disaster before, but not quite like this. 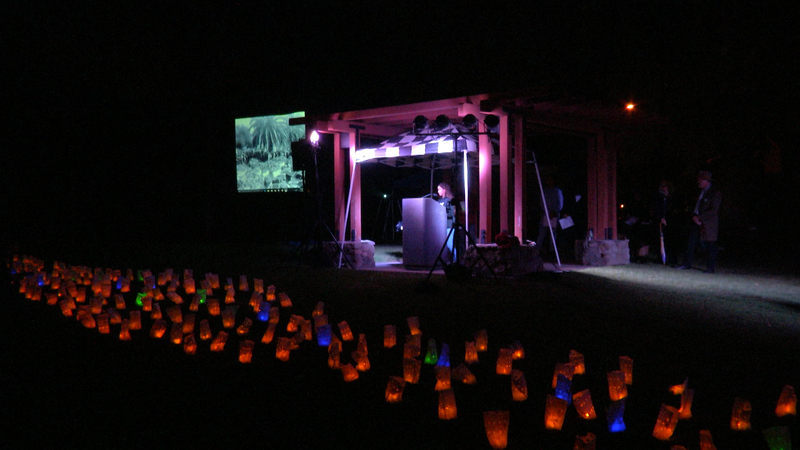 A river of light spanned Ebell Park as 411 yellow, blue and green luminaria candles were arranged to represent the 54-mile path of destruction — one candle for each victim from Saugus to the sea. Emcee Edward Arguelles, a retired history and government teacher, explained that the number of candles reflected the latest research by archaeologist Ann Stansell, whose 2014 study as a graduate student at California State University, Northridge provided the first comprehensive understanding of who the dam victims were. It was the most significant “fresh” research into the disaster since engineering professor J. David Rogers’ work two decades earlier to explain exactly why the dam broke. A highlight of the evening was a reading by 15 elementary and secondary students under the direction of Paul Tonello, a social studies teacher at Santa Paula High School. The students were selected, one from each school, to speak on behalf of individuals from Santa Paula who would never speak again after March 13, 1928. | Santa Paula still stands. And Santa Paula doesn’t forget.